Prior to the ratification of the 25th Amendment, the rules of succession to the Presidency were constitutionally vague. The Constitution did not specify whether the Vice President would become President or Acting President if the President were to die, resign, be removed from office or become disabled. Due to the lack of clarity, some Presidents and their Vice Presidents took it upon themselves to draft agreements for handling Presidential succession and inability. These agreements specified the terms for declaring a President unable to perform the duties of office, and the terms for re-instatement once able to return to duty. 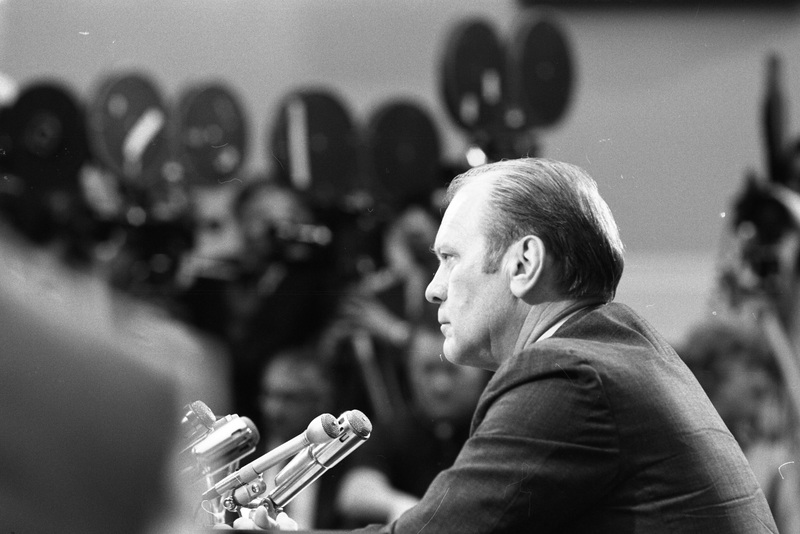 Gerald R. Ford and members of the press at his Vice Presidential confirmation hearing before the Senate Rules Committee, 11/1973. On January 6th, 1965, Senator Birch Bayh of Indiana and Representative Emanuel Celler of New York introduced joint resolutions in the Senate and House of Representatives aimed at clarifying and defining the rules on Presidential succession and inability in the Constitution.�The Bayh-Celler proposals, which formed the foundation of the 25th Amendment, refined the processes of declaring a President incapable of fulfilling the duties of office and filling a Vice Presidential vacancy. Congress approved the 25th Amendment on July 6, 1965, the States completed ratification by February 10, 1967, and President Lyndon Johnson certified the amendment on February 23, 1967. The first use of the 25th Amendment occurred in 1973 when President Richard Nixon nominated Congressman Gerald R. Ford of Michigan to fill the vacancy left by Vice President Spiro Agnew�s resignation. In less than a year, the 25th Amendment would be used again. This time when Vice President Ford became President after Richard Nixon resigned, and he nominated Nelson Rockefeller to fill the Vice Presidential vacancy left by him. Senator Birch Bayh and Representative Emanuel Celler introduce joint resolutions proposing a constitutional amendment on Presidential succession and inability in the House and Senate. The Senate votes to pass S.J. Res. 1, a proposed constitutional amendment on Presidential succession and inability. The House votes to pass H.J. Res. 1, a proposed constitutional amendment on Presidential succession and inability. Congressional Record - Gerald R. Ford speaks on House floor in favor of the amendment. Because the House and Senate passed different versions of the proposed amendment, a special committee is convened to work out the differences. The House votes to adopt the conference report on S. J. Res. 1, a proposed Constitutional amendment regarding Presidential succession and inability. After Congress passes the Joint Resolution to amend the Constitution, the amendment is forwarded to the States for ratification. The States complete ratification of the 25th Amendment. The 25th Amendment is certified by President Lyndon B. Johnson. On October 10th, 1973, Vice President Spiro Agnew, resigned after being indicted on charges of accepting bribes and evading income taxes while Governor of Maryland. Two days after Agnew's resignation, Nixon nominates Representative Gerald R. Ford of Michigan, who at the time is House Minority Leader, as Vice President. This would be the first time a Vice Presidential vacancy is filled using the 25th Amendment. Confirmation hearings by the Senate and House begin, soon leading to votes by both chambers to approve the nomination. Ford is sworn in as the 40th Vice President on December 6, 1973. House Minority Leader Ford gives his views on the charges against Vice President Agnew. He believes that a House investigation should be conducted in order to give Agnew a fair hearing, and that the House should act as soon as possible. Ford comments on Agnew's resignation, and what he thinks the next steps by Congress should be. Upon Agnew's resignation, President Nixon requests that members of the Cabinet and Congress submit to him their recommendations for a Vice Presidential nominee. Congressman J. William Stanton of Ohio, submits a recommendation to President Nixon. President Nixon nominates House Minority Leader Ford to be Vice President. He is the first Vice President to be nominated under the 25th Amendment. The FBI begins background investigation of Ford, the largest and most intensive investigation ever of a candidate for public office. During its investigation, the FBI uses 350 special agents, interviews more than 1,000 witnesses, and compiles 1,700 pages of reports. Ford submits documents and information to the House and Senate Judiciary Committees for use in considering his nomination. Ford seeks advice from Hubert Humphrey, Vice President under President Lyndon B. Johnson. Humphrey writes Ford a letter explaining the responsibilities of the Vice President, the power they hold, and suggestions on what the Vice President should do while in office. The Senate Judiciary Committee begins its confirmation hearings on Ford's nomination as Vice President. The House Judiciary Committee begins its confirmation hearings on Ford�s nomination as Vice President. Edward Hutchinson, Representative from Michigan's 4th Congressional District, and close friend of Ford, speaks to the House Judiciary Committee on his behalf. Ford writes an essay on what the Vice Presidency means to him. The Senate confirms Ford�s nomination by a vote of 92-3. The House confirms Ford�s nomination by a vote of 387-35. In front of a Joint Session of Congress, Ford is sworn in as 40th Vice President by Chief Justice Warren Burger. After President Nixon resigns under threat of impeachment due to the Watergate scandal, Vice President Ford, is sworn in as the 38th President of the United States on August 9, 1974, leaving the Vice Presidency vacant once again. After some deliberation and conferring with leaders of Congress and the Cabinet, on August 20th, Ford nominates Nelson Rockefeller, the former Governor of New York, as his Vice President. After four months of extended hearings, Rockefeller, is confirmed as the 41st Vice President of the United States, the second person to fill the office under the 25th Amendment. As the Watergate scandal unfolds, Al Haig, Nixon�s Chief of Staff, advises Ford that he should prepare for a transition to the Presidency. Ford attends a Cabinet meeting and tells Nixon he will continue to support Nixon�s policies, but can no longer speak on the issue of Watergate to the media and the public. Nixon announces his decision to resign in a televised address. Ford is sworn in as the 38th President of the United States. In his swearing-in remarks, Ford announces �Our long, national nightmare is over.� Following the ceremony, President Ford goes immediately to work, meeting with Congressional leaders, senior White House staff, transition advisers, senior economic advisers, and foreign emissaries. The Vice Presidency is vacant for the second time in less than a year. Once again, the 25th Amendment will be invoked to fill this post. President Ford, like his predecessor, asks leaders of Congress and the Cabinet for their Vice Presidential recommendations. President Ford nominates Nelson Rockefeller, former Governor of New York, to be his Vice President. Like Ford, Rockefeller undergoes an extensive FBI background investigation. He also seeks out advice from Congressional leaders on the implications of the 25th Amendment and the Vice Presidency. The Associated Press report on the impending confirmation hearings of Rockefeller. The A.P. predicts Rockefeller will be confirmed, but that they don't believe it will be a quick confirmation. The Rockefeller confirmation process takes longer than that of Gerald Ford. President Ford writes to Congress to encourage them to speed up the confirmation process for the sake of "carrying out the clear intention of the 25th Amendment to the Constitution." Ford gives speeches about the intentions of the 25th Amendment, and how the nation needs a "Vice President at all times." Ford's Letter to Congressman Hutchinson, to request his help in speeding up the confirmation process. Ford's draft of his letter to Congress imploring Congress to speed up confirmation proceedings. Rockefeller is confirmed by the Senate by a vote of 90-7. Rockefeller is confirmed by the House by a vote of 287-128. Rockefeller is sworn in as the 41st Vice President of the United States. .